Next meeting: February 10, 2014 @ 7:30 p.m. Please join the Historical Society of Amherst as we welcome Adair Mulligan and her presentation on “The Secrets of Cellar Holes.” Northern New England is full of reminders of past lives: stone walls, old and foundations. Mulligan will explore the rich story to be discovered in what remains behind. Mulligan holds a master’s degree from Smith College and is the author of “The Gunstock Parish, A History of Gilford, New Hampshire.” She is the executive director of the Hanover Conservancy, and has served for 20 years as conservation director of the Connecticut River Joint Commissions. This exciting program will take place in the Vestry of the Congregational Church of Amherst on Monday February 10, 2014 at 7:30 p.m.
What secrets of past lives lie hidden deep within this old cellar hole? Would you like to learn a little more about cellar hole exploration? Then click on this LINK to The Lyme Historians to learn of their interesting survey project. The conditions underfoot last night, January 6, were near treacherous, as temperatures plummeted and turned the days heavy rainfall into a frozen, slippery mess. But these meteorological conditions failed to dissuade the Development Committee from meeting last night at 6:30 pm at the Amherst library. 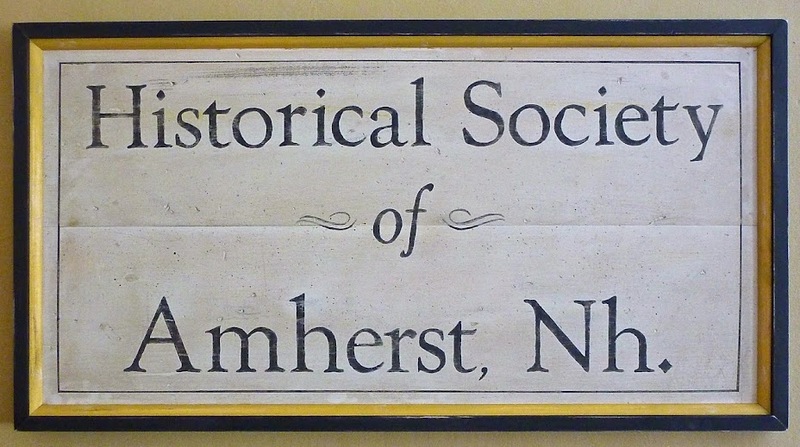 Historical Society of Amherst, Development Committee. 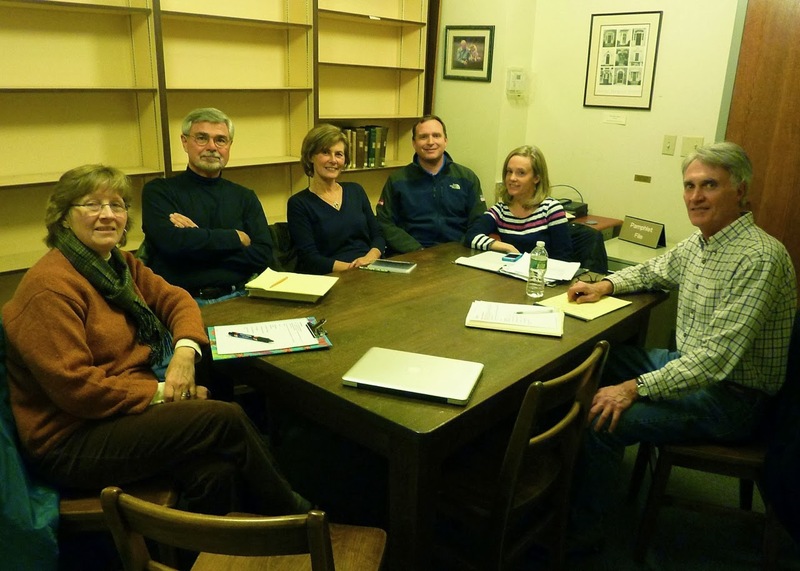 L to R: Janice McDermott, Ken Lawson, Tracy Veillette, Neil Benner, Perrin Enriquez and Dave Clark, meet to strategize the future course of the historical society. The purpose of this committee is to expand membership by adding value to our offerings. Currently we offer engaging speakers, special events, such as Antiques on the Green, a generous scholarship fund, two beautifully presented museums in historic buildings, a well researched newsletter and a vast selection of photographs, postcards and other well organized research materials maintained by an enthusiastic core group. The committee is charged with developing a marketing strategy to increase membership by attracting former participants as well as new members and creating a corporate sponsorship base. Amherst is a unique, small New Hampshire town with an exciting past that remains alive through its extraordinarily well maintained village. We'd like to share this history and attract other historical enthusiasts to enjoy it as well. Our next meeting is scheduled for Monday, February 10th at 7:30 pm at the Congregational Church across from the common. We look forward to seeing you and guests who may wish to attend. Located across the street from the common, where it once stood, this is Amherst's Second Meetinghouse, constructed in 1771. 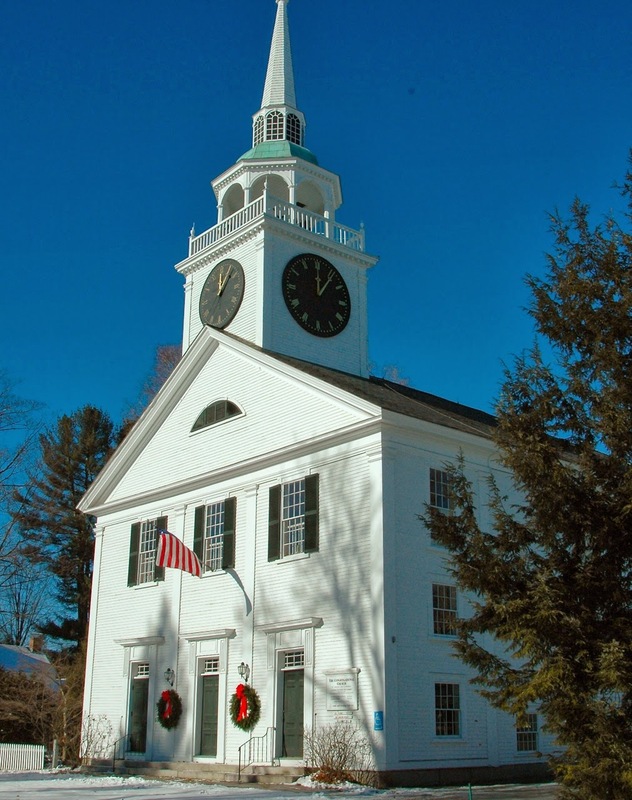 The building was sold to the Congregational Church Society in 1832, but the town retained ownership of the clock tower. It was moved from the common to its present location in 1836.